Barcelona is a city of trees. Of course not as exuberant as we would like but enough to add a note of color, clean up the smog a bit and make people more environment-aware. Catalans care about green. You could say trees are part of the urban furniture. There are plenty of parks in Barcelona and Parc de la Ciutadella in this picture is one of the most emblematic and visited. I have to confess our respect for nature is not as profound so as to go and stretch our bodies standing around a tree so this particular group called my attention. 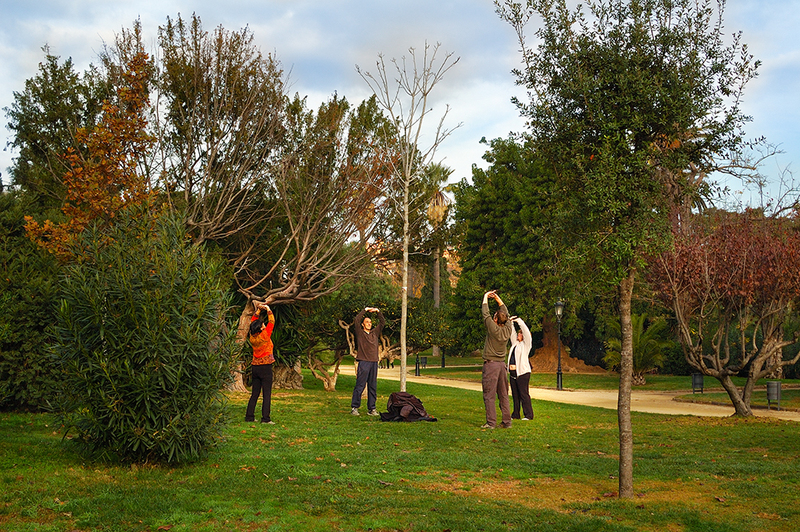 My first thoughts were that it was some kind of pagan ritual calling the powers of Earth and trees in this case cause the man who was leading the exercise was waving at me not to take the picture. Perhaps I was interfering in their concentration. I guess it was only part of some yoga routine. By the way, I read that in Feng Shui, trees represent strength and are considered a source of protection. Whatever the reason they gathered round the trunk for, you have to admit that it was a healthy thing to do much more attractive to the eye that a drunkard sleeping in a nearby bench. Yes, my friends, trees, our city lungs, can filter the air but they won't do miracles!